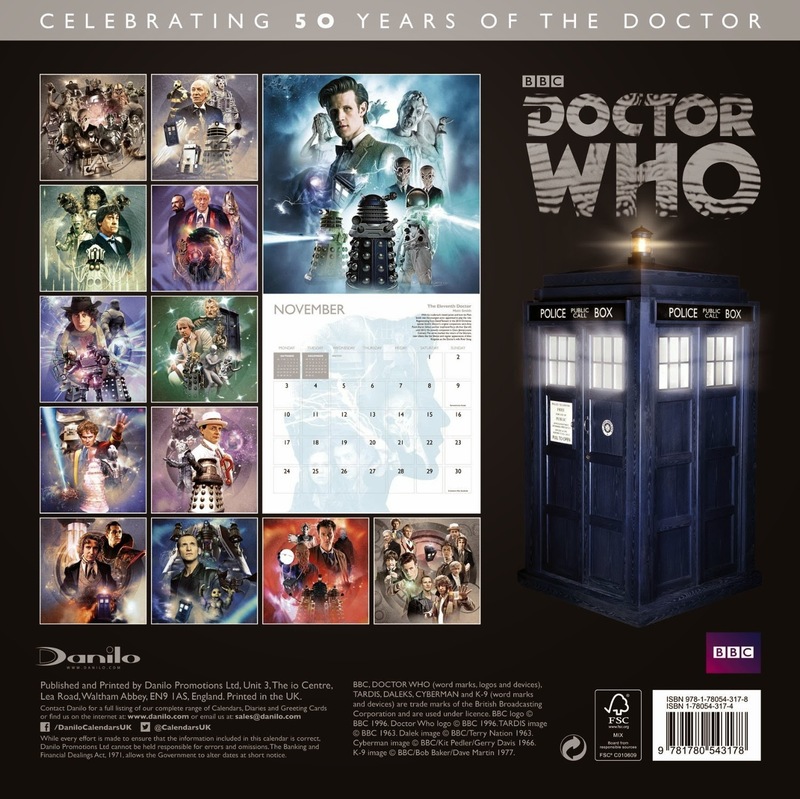 As you might expect, there's a 'standard' one which covers the season just transmitted; but also for this year, a special '50th Anniversary' calendar covering the series as a whole. 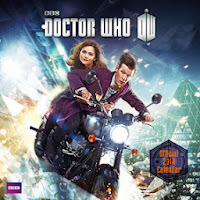 In the one for the 2012/2013 series (Season 7 for those interested in such designations, or Season 36 ...) it follows the standard pattern of celebrating each story on each month, so we have all the stories from 'Asylum of the Daleks' through to 'Name of the Doctor' with 'The Snowmen' thrown in for good measure in December. The art is nice and I think is all by Lee Binding (I recognise some of the images as using elements from the 'posters' used to promote each story. There's a couple of pics at the bottom of each page too, and the whole thing is really very attractive. 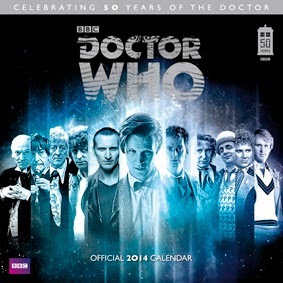 The 50th Anniversary Calendar takes a similar approach, giving each month over to a different Doctor, with December featuring all of them. The art is gorgeous and is again (I think, though happy to be corrected) by Lee. Again, it's photo collages and is colourful, well designed and evocative. 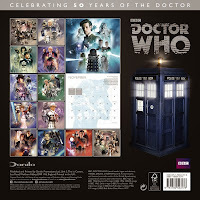 I love the Troughton piece especially. Along with the two Calendars, there's also a 2014 diary, which is basically the same TARDIS design as the 2013 one! It's dotted with new pics of the 11th Doctor, Clara, Ice Warrior, Cyberman and so on, and is a neat little slim pocket diary!